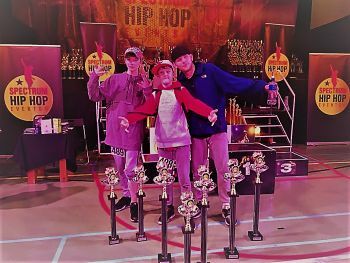 Huge congratulations to Jenny, Chris and Jake who knocked it out of the park this weekend in Trabolgan at the All Ireland Hip Hop Championships. Chris swept the boards taking 1st pace in under 14 Champion Solos, 1st in under 16 Breakdance and 1st in under 16 Poppin. Jake came 2nd in Under 16 Breakdance and 2nd in Under 16 Poppin. Jenny reached semi-final in the under 12’s B’Girl. We are so proud of this enormous achievement. The photo is of Chris, Jake and Leon. Leon teaches Breakdance and Poppin at Kidkast. We are the only school to offer Poppin and Breakdance classes locally.